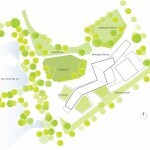 The new Ergolding Secondary School sits within a far-stretching natural and artificial landscape. 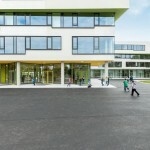 70 km north-east from Munich, it provides the much needed secondary school capacities to the region around the Bavarian town of Ergolding, close to Landshut. 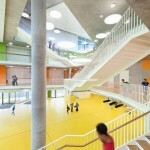 The heart of the new school is a large open atrium that serves as an assembly hall, an interior meeting point, and a visual connection between the school’s various departments and functions. 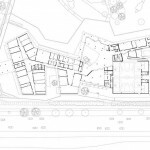 Through this central hub, students can easily and intuitively find their way from the classrooms on the upper levels down to the music area, the gymnasium, the cafeteria, and the recreation rooms that sit on the ground level. 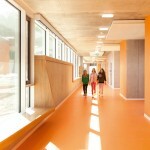 The hallways that lead from the classrooms and workshops gradually open up and broaden to become ‘extensions of the classrooms’ themselves with individual and group working spaces. These provide the students, teachers and parents with informal meeting points for gathering, planning extracurricular activities, and exchanging information. 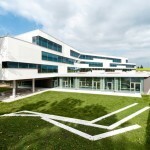 These ‘learning landscapes’ essentially strengthen the pedagogical work within the new building. The classrooms are setup for flexible and versatile layouts that are informed more by the needs of the students than by pure, lecture-based teaching. 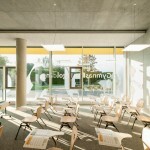 Different working methods, both noise-intensive collaborative group work and concentrated, individual desk work, are both fulfilled by decentralized ‘learning stations’ where alternative, interactive educational situations can develop. The school accommodates 800 students with four classes per grade level and includes a cafeteria, a library, areas for assisted studying, and breakout rooms for play and relaxation. The two-field gymnasium is also available for use to external groups such as the adjacent school nearby, or to special clubs. To meet the base load demand for heating and cooling, a heat pump is used over the thermally-activated reinforced steel concrete slabs. The peak load demand is met by a gas-fueled boiler. A hybrid air conditioning system works manually and automatically to ensure a continuous, high air quality throughout the day. 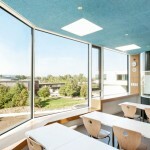 To optimize natural daylight, the north facing classrooms use light directing systems that bring daylight in from the southern corridors to the north facing classrooms. 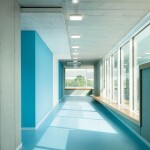 On most days throughout the school year, the energy demand for artificial lighting can be reduced. 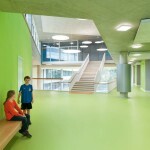 The presence of natural daylight throughout the interior greatly impacts both to students’ and teachers’ comfort, attentiveness, and well-being. 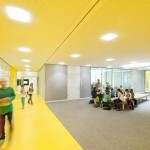 Throughout the whole building, both inside and outside, LED lighting is used. 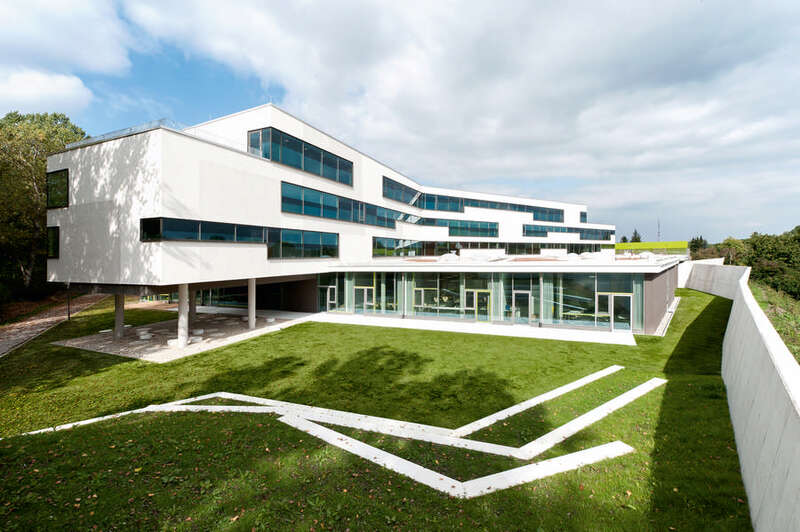 The new Ergolding Secondary School is a simple, technically optimized structure that establishes a warm, colorful and inviting interior for learning, one that reacts to and reinforces the qualities of the School’s pedagogical vision.